Measurements of electrical properties of a plastic tape (yellow), taken using a specially designed microwave cavity (the white cylinder at center) and accompanying electrical circuit, change quickly and consistently in response to changes in the tape's thickness. The setup is inspired by high-volume roll-to-roll manufacturing devices used to mass-produce nanomaterials. The changes in the tape's thickness spell NIST in Morse code. 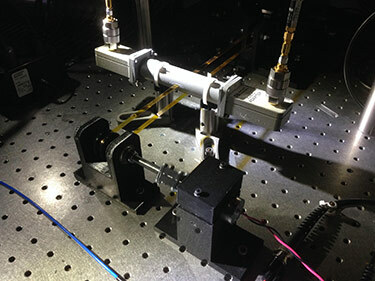 Manufacturers may soon have a speedy and nondestructive way to test a wide array of materials under real-world conditions, thanks to an advance that researchers at the National Institute of Standards and Technology (NIST) have made in roll-to-roll measurements. Roll-to-roll measurements are typically optical measurements for roll-to-roll manufacturing, any method that uses conveyor belts for continuous processing of items, from tires to nanotechnology components. In order for new materials such as carbon nanotubes and graphene to play an increasingly important role in electronic devices, high-tech composites and other applications, manufacturers will need quality-control tests to ensure that products have desired characteristics, and lack flaws. Current test procedures often require cutting, scratching or otherwise touching a product, which slows the manufacturing process and can damage or even destroy the sample being tested. To add to existing testing non-contact methods, NIST physicists Nathan Orloff, Christian Long and Jan Obrzut measured properties of films by passing them through a specially designed metal box known as a microwave cavity. Electromagnetic waves build up inside the cavity at a specific “resonance” frequency determined by the box’s size and shape, similar to how a guitar string vibrates at a specific pitch depending on its length and tension. When an object is placed inside the cavity, the resonance frequency changes in a way that depends on the object’s size, electrical resistance and dielectric constant, a measure of an object’s ability to store energy in an electric field. The frequency change is reminiscent of how shortening or tightening a guitar string makes it resonate at a higher pitch, says Orloff. The researchers also built an electrical circuit to measure these changes. They first tested their device by running a strip of plastic tape known as polyimide through the cavity, using a roll-to-roll setup resembling high-volume roll-to-roll manufacturing devices used to mass-produce nanomaterials. (See video.) As the tape’s thickness increased and decreased—the researchers made the changes in tape thickness spell “NIST” in Morse code—the cavity’s resonant frequency changed in tandem. So did another parameter called the “quality factor,” which is the ratio of the energy stored in the cavity to the energy lost per frequency cycle. Because polyimide’s electrical properties are well known, a manufacturer could use the cavity measurements to monitor whether tape is coming off the production line at a consistent thickness—and even feeding back information from the measurements to control the thickness. Alternatively, a manufacturer could use the new method to monitor the electrical properties of a less well-characterized material of known dimensions. Orloff and Long demonstrated this by passing 12- and 15-centimeter-long films of carbon nanotubes deposited on sheets of plastic through the cavity and measuring the films’ electrical resistance. The entire process took “less than a second,” says Orloff. He added that with industry-standard equipment, the measurements could be taken at speeds beyond 10 meters per second, more than enough for many present-day manufacturing operations. The new method has several advantages for a thin-film manufacturer, says Orloff. One, “You can measure the entire thing, not just a small sample,” he said. Such real-time measurements could be used to tune the manufacturing process without shutting it down, or to discard a faulty batch of product before it gets out the factory door. “This method could significantly boost prospects of not making a faulty batch in the first place,” Long noted. Films of carbon nanotubes and graphene are just starting to be manufactured in bulk for potential applications such as composite airplane materials, smartphone screens and wearable electronic devices. Orloff, Long and Obrzut submitted a patent application for this technique in December 2015. A producer of such materials has already expressed interest in the new method, said Orloff. “They’re really excited about it.” He added that the method is not specific to nanomanufacturing, and with a properly designed cavity, could also help with quality control of many other kinds of products, including tires, pharmaceuticals and even beer.